It was so much like spring where I live the last few weeks that I need to get into the spring-polish mood and hope that this cold goes away! 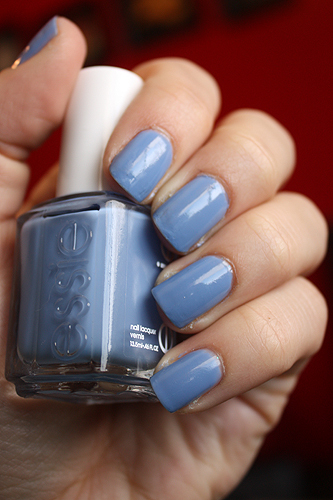 So after enjoying and loving my Gosh Miss Minty manicure for the week, I decided to go onto a beautiful light cornflower sky blue; Essie Lapiz of Luxury. 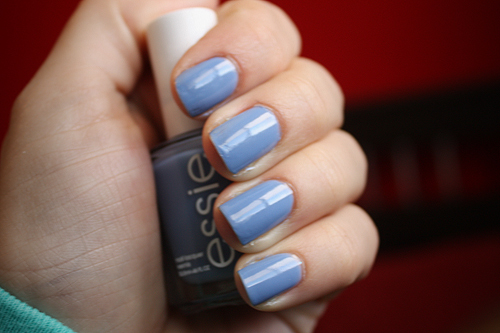 This polish is from the Resort 2010 collection and I am so anticipating the Resort 2012 collection! They are gorgeousssss polishes. Anyway, onto Lapiz! The colour is gorgeous and the application was decent. I did two thin coats and a fairly thick third coat. I probably could have got away with 2 coats if they were on the thicker side but when I did it, I still had VNL on the second coat. Excuse my cuticles - I've worked a lot in the last week. On top of Lapiz of Luxury I added my new Luxeffects addition to my collection - Pure Pearlfection. This polish is gorgeous. It's a pearly microglitter and it just reflects light so beautifully off the nail. It's the perfect addition to any nail polish. This is a "gradient" effect, so its closer to 3 coats at the tip of my nail and 1 near the base. Which of the luxeffect collection have you picked up? Which one is must-have in your opinion? Following can you follow back?! I agree with you... You can never follow to many blOgs!